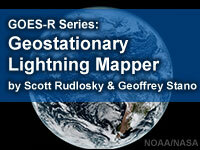 In this webinar recording Scott Rudlosky and Geoffrey Stano discuss and demonstrate the capabilities of the GOES-R/16 Geostationary Lightning Mapper (GLM) in both operational and research applications. You will learn how the GLM, the first lightning mapper in geostationary orbit, differs from land-based lightning detection. The presenters summarize important processes known as lightning events, group, flashes, and lightning jumps and show products that illustrate the location and areal extent of lightning, and its evolution in cloud systems. With this information you should be able to integrate lightning data into studies about storm type and evolution, lightning safety, lightning climatology, multi-sensor products, wildfire initiation, and more. This is a recorded webinar presented by instructors at their home institutions. Audio variations may exist. Excellent presentation. Easy to follow in a logical manner. Short but efficient introduction to GLM. This is a great introduction to the Geostationary Lightning Mapper (GLM) instrument on the new GOES weather satellites. It's accessible to beginners, but presents additional details that experts will find helpful. A good lesson. Like the presenter's communication skills. I think this is Level 2, my junior scientists would have to study other topics to get the most out of this lesson. Pre-course questionair is just guesswork if you have no prior knowledge of this particular satellite. Basing my answers on some background physics did not help others and as to how you are meant to know some of the answers specific to this sattellite and the analysis tree I do not know - one might as well start with a score of zero rather than the 25 to 33 % you get by entering random answers. Just a little glitch......Include your MetEd status (currently: 10 passed quizzes) <----that's what is says. Nope. I passed a heck of a lot more then 10.